Tampa, FL – An artist and guitarist since the 1970’s, Virgil Mandanici set out to make guitars that would be exceptional in tone and playability first and foremost. After 35 years of playing guitar, he decided it was time to craft guitars that would feel, play and look better than anything anyone has ever played before – thus Virgil Guitars was born! As a master craftsman, Virgil has drawn his building career from several luthiers over the past several years to make these incredible guitars. The inlay and appointments on his guitars are simply a testament to his attention to detail. Says Virgil, “After playing guitar for over 35 years, I knew what I was looking for in tone and how a neck should feel and had been willing to go to any length to achieve the ‘perfect’ guitar fit for myself, and ironically, other players. On certain models, they come with a DVD that shows the birth of my guitars starting out with a chunk of wood all the way to a music video – I do every step of this process by myself, in-house. Since they are “One-offs”, there will NEVER be two guitars alike, so all owners of a Virgil Guitar will have their own unique tone and feel. I also make different guitars to fit different budgets, since most players to not want too much ornamental appointments on their guitars”. Virgil’s 1st guitar, the “Dueling Dragons” was featured in the September 2013 issue of Guitar World (http://www.guitarworld.com/it-might-get-weird-mandanici-s-best-friend-virgil-dueling-dragons-guitar ) and he did quite well selling the guitar to a collector in 2012 for $17,000.00 USD. Virgil has made 17 guitars to-date, making each one totally unique of the others. Virgil had experienced a slowdown in sales over the past year as so many other builders have in the custom guitar building industry and decided to take a different approach. “I had spent my first few years as a builder developing my skills and spending most of my profits on state-of-the-art equipment, processes and supplies to build up an inventory but this year, things have slowed down so much, I wasn’t able to allocate any monies towards advertising.” says Virgil. In comes “Kickstarter”. Virgil saw an opportunity to get his name out there and get busy making at least something via a Kickstarter campaign. 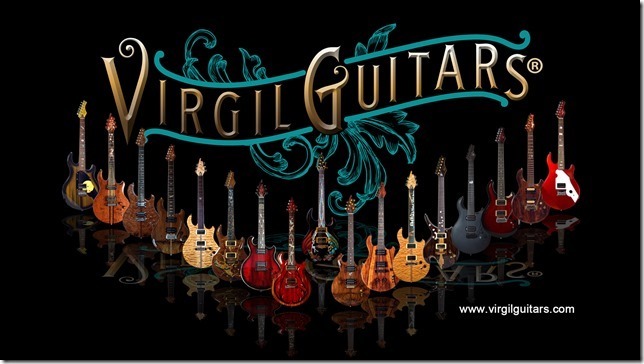 Virgil’s Kickstarter campaign ends on September 6th, 2014 and he has been getting people to commit to his project because they believe in what he’s doing and agree that the guitars he builds really need to be seen by the world. As of the writing of this article, Virgil’s campaign was at 260% of goal and he’s still pushing for the stars.